ROAD TOWN, Tortola, VI – Magistrate Tamia Richards was critical of the delays caused in the trial of four men accused of gun and cannabis possession, citing the movement of files from desk to desk at the Director of Public Prosecution’s (DPP’s) office as a reason for the delays. When the four appeared before the Magistrate’s Court on October 19, 2012, they encountered a different person representing the Crown’s case against them in Senior Crown Counsel, Sarah Benjamin. Benjamin explained to the Court that she was holding for her colleague, Leslie-Ann Faulkner, who was in the High Court at the time. However, she related that a number of documents were still outstanding, including the albums for the case file, and a statement from the officer involved in the matter. She also noted that the alleged firearm was yet to be tested and as a result the crown would not be ready to proceed on the matter at the time. The matter for the four accused, Mustafa Claxton, 26, of Free Bottom; Jose Miguel Christopher, 28, of Long Look; Shaun Williams, 31, of Purcell Estate and Chaim Todman, 32, of Johnson Ghut was set for trial according to Ms Benjamin. The men are charged with a number of offences including alleged unlawful possession of a firearm and ammunition, unlawful importation of a firearm and ammunition, conspiracy to import, importation and unlawful possession of cannabis with intent to supply. They have all pleaded not guilty. Meanwhile, Christopher, Williams and Claxton have also been slapped with illegal entry charges. They too pleaded not guilty to that offence. Attorney-at-law, Herbert McKenzie, who represented Todman and Claxton, said on September 7, 2012 that the court had instructed that full disclosure be made by September 11, 2012 and a trial date of October 19, 2012 was set. He noted that some documents were only received on October 18, 2012. Mr McKenzie then enquired whether the court could have the prosecution determine who would have conduct in the matter to avoid having unnecessary adjournments as he had made the observation that a change in headship at the DPP’s office may have resulted in the recent instances of one crown counsel holding for another in some cases. Attorney-at-law, Patrick Thompson, who represented Williams and Claxton, concurred with his colleague. Ms Benjamin then expressed that it was immaterial who had conduct of the matter but Magistrate Richards quickly interjected to say that it was material since the files were “hopping from desk to desk at your office” and this was causing delays. Magistrate Richards instructed that full disclosure was to be made to the defence and the prosecutor who had conduct in the matter. 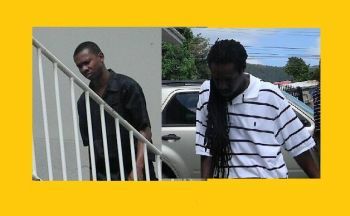 The four men were previously granted bail on their first appearance at the Magistrate’s Court on April 17, 2012. The quartet was allegedly found with the illegal items on April 15, 2012 during a stop and search carried out on a blue Mitsubishi motor vehicle in the West End area. After listening to mitigation from Christopher, Todman and Williams’ lawyers, Senior Magistrate Valerie Stephens offered Christopher, Williams and Claxton each $60,000 bail with signed surety. Their Virgin Islands passports were to be surrendered and they were to report to the Road Town Police station every Monday, Wednesday, Friday and Sunday. As for Todman, who had two court cases pending, he was offered $70,000 signed surety and had to report to the Road Town Police Station everyday between 6 a.m. and 6 p.m. According to court records, April 15, 2012, four men were observed by Police disembarking a power boat moored at Shepherds Marina, Frenchman Cay. Four males were allegedly collected by Chaim Todman. A short distance away Police carried a stop and search of the vehicle. One of the men exited the vehicle and escaped. The three passengers were identified by Police as being the occupants of the boat. A search of the vehicle allegedly uncovered a Glock 40 handgun containing 14 rounds of ammunition and three packages containing a total 260 grams of marijuana. Christopher was also allegedly found to be in possession of 10 grams of marijuana. The men were instructed to return to court on November 6, 2012. Dey legal system in tis lil place broken! yep this place is a joke! all this time the fire arm is not tested jah!!!! I hate seeing or hearing about people I went to school with getting into all this trouble...in school they were so kool and came from a Christan home and background..what went wrong???? Despite what some of you may think these are our sons and people!